We do like to be beside the seaside, don’t we? Fish and chips and a nice cup of tea, greedy seagulls, knobbly shingle or gritty sand between our toes, the choppy grey sea, a sticky 99 and squealing children, sunshine sometimes if we’re lucky. The British love affair with the coast has had a few ups and downs over the years. We’ve been tempted by faraway shores at times; but there’s no doubt that our beaches have been enjoying a revival during the last 15 years or so. We’ve seen new artistic communities emerging by the sea, and an insatiable love of all things vintage (thanks Cath). So too a general nostalgia, and a yearning for a more sustainable, natural way of life. Local and organic, mindfulness…21st century trends have all led to a renewed appreciation of what’s right on our doorstep. It’s painfully fashionable, but so what? Let’s enjoy it. My sons are (hopefully) experiencing the kind of childhoods you want for them when you decide to bring a little person into the world. That’s forgetting the everyday stresses and problems of family life you cannot foresee. Bunting and a rose print can only do so much, after all. They go fossil-hunting at Folkestone and clamber over the rocks in Hythe, camp in a clunky old campervan in the country, play board games, explore the woods of Kent, and run wild at Camber. Don’t get me wrong, there’s also a lot of YouTube, Minecraft and Mario, and the odd holiday to France too. What we have never experienced though is a beach hut. There are beach huts around the world, but it is Britain that has really taken them to its national heart. When the wheels dropped off our Victorian bathing machines, and we didn’t care so much about showing our knees in public, the timber boxes remained. Perfect for changing into your cossie, having a brew and storing seaside paraphernalia, by the early 1900s they had a slightly down-at-heel image. During the 1930s though, the tides were turning: suntans had become fashionable, with lidos and sun terraces springing up. Royalty and movie stars were now spotted in the humble beach hut. The Second World War very rudely shut all of our beaches, but once it was over you couldn’t keep us away from the sea. The 1950s were the real heyday of the beach hut in Britain. 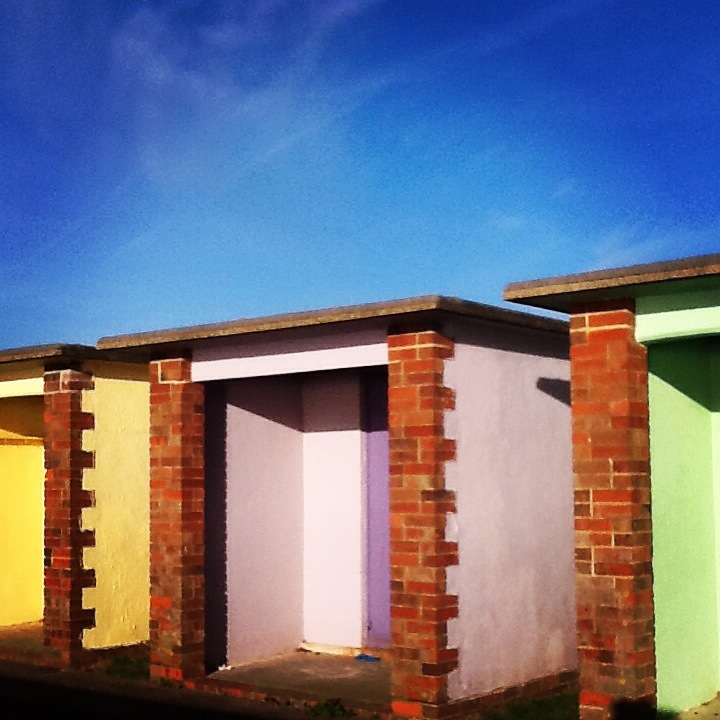 Hythe has a modest row of what look like 1950s beach chalets. Or maybe 1930s, the more I study them. Google and the library’s local history shelf have let me down when it comes to tracing their precise creation date. Hythe Civic Society is very kindly hunting around in the archives and thinks that they were built sometime just before or after WWII. They are not the most good-looking beach huts, and they seem very underused, retaining a depressing bus shelter air which reminds me of growing up here in the 1980s – a low point for the British seaside and my hair. Owned by the council and leased to a local builder, they could be so much more. As ever, no one with the power and cash to do so has capitalised on the town’s vintage seaside credentials or fishing heritage to improve the environment for those of us who have chosen to live here, or to promote vital tourism either. In other Kent, Suffolk, Sussex, Essex and Dorset towns you will find very beautiful beach huts, oozing vintage vibes, uber cool shabbiness or a beachy New England feel. They’re decked out in 1950s fabric, enamel kitchenware and all manner of retro picnic gear, or rocking some serious Ralph Lauren nautical style. 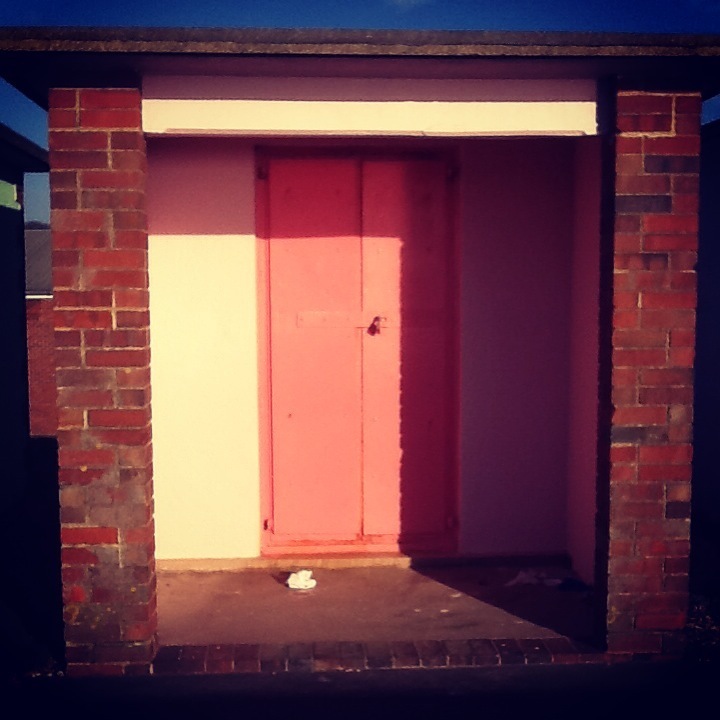 In some counties, new beach huts have been built, old ones have been part of regeneration schemes. Some are privately owned, many are leased from local councils. Most beach huts are for day use only and few offer running water or electricity. There are more than 20,000 beach huts around the UK. People get married in them, sell arts and crafts, serve tea and cake, tuck into BBQs, sip Pimms and Prosecco, and enjoy family days out in towns like Southwold, Mudeford, Bournemouth, West Wittering, West Mersea and Whitstable. It’s not quite the same in Hythe. And yes, I know, sometimes the whole kitsch cupcake vintage thing can start to make you feel slightly sick. I’d just be happy to see more old fellas in their sandals enjoying their flask tea or screaming kids grabbing their buckets and spades, and more of that beach hut community that seems to exist along other parts of our coast. And there’s no doubt that there are plenty of opportunities around the beach huts to boost the appeal of the Marine Parade end of the seafront. Griggs at the Fisherman’s Beach is going great guns with its steadily expanding range of tasty seafood treats which you can eat on wooden benches right on the pebbles. The cafe next to the beach huts is functional, and that’s being kind. Whoever decided to make urinals and a cafe part of the same building anyway? Imagine what it could be? A pleasure for us, and a great way to attract more visitors to Hythe. It does seem like things are soon to change for the Hythe beach huts, but possibly not in a good way. There has been some public controversy over the way the Hythe (and Folkestone) beach huts have been managed by the private landlord. The land they sit on appears to be part of a Shepway district council site allocated for housing if the Princes Parade debacle is ever sorted and the South Road pool closes. The minutes of a recent Shepway council meeting mention the possibility of developing the beach huts as part of their Oportunitas ‘vehicle’ (a shadowy sounding thing), but say no more. Could they soon be a thing of the past? I think that would be a shame. Bunkerish as they are, those concrete and brick boxes are a piece of Hythe’s 20th century history and, more importantly, they could be a really valuable part of the town’s future. Restore them, rent them out fairly to day trippers, artists, craftspeople and vintage sellers, create a lovely new beachfront cafe, and bring back the donkeys! 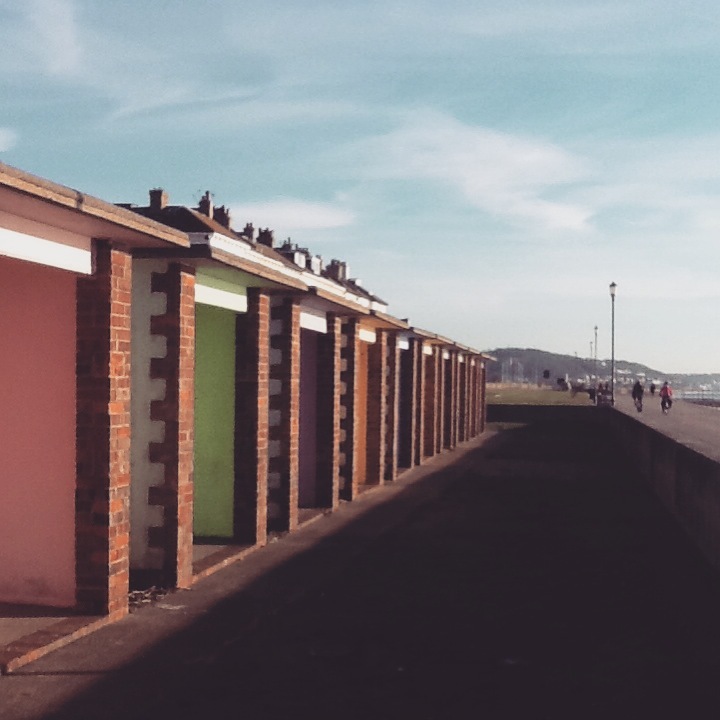 If you know anything about the history of Hythe’s beach huts, or indeed their future, please do share it below.